Yesterday HEXUS was among the first to publish an in-depth review of the new Intel Core i9-7980XE (14nm Skylake-X). 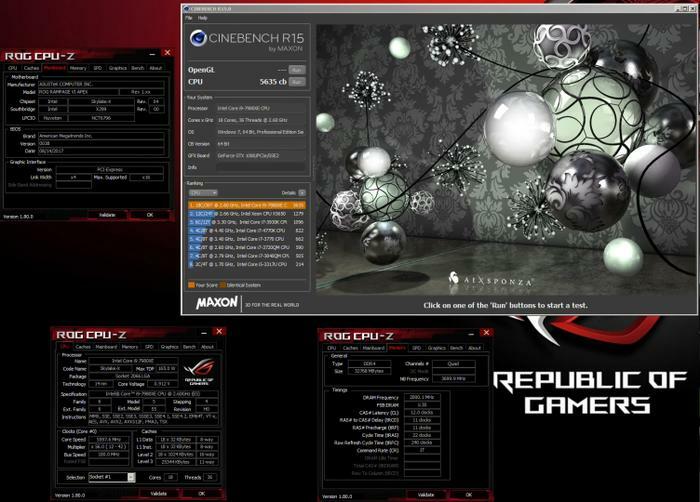 In our overclocking tests we found it wasn't too difficult to achieve a stable 4.5GHz on all cores. That made a significant difference in some tests, moving the CPU from an approx 8 per cent lead in Cinebench against the AMD Threadripper 1950X to a resounding 30 per cent performance advantage. Meanwhile, in 3DMark Time Spy, the OC we achieved nudged the Core i9-7980XE from second place to pole position above AMD's Threadripper 1950X. The above is what we could do with a little time tweaking the CPU and motherboard settings to achieve a stable overclock but extreme overclocking experts have already gone much further. 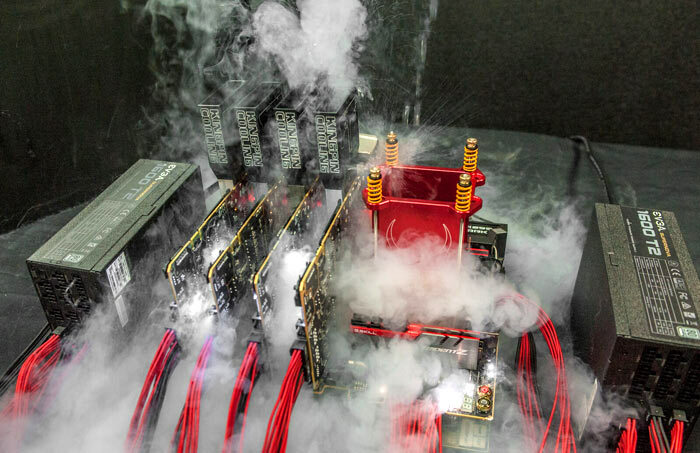 EVGA wrote to HEXUS to trumpet the news that KingPin had broken four new performance world records using the Intel Core i9 7980XE CPU, Liquid Nitrogen cooling, and the latest EVGA hardware. During his record breaking attempts KingPin ran the new Intel CPU at over 5.7GHz. 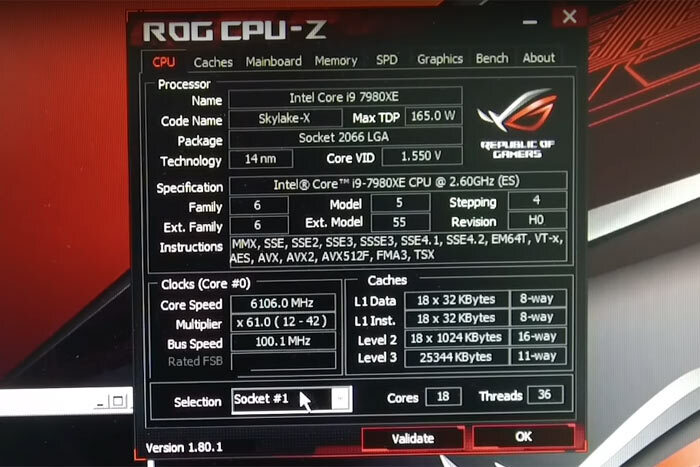 CPU overclocking expert Der8auer yesterday published a video talking about his LN2 overclocking of the new Intel Core i9 7980XE. In his video it is explained that he got early access to the processor at Asus HQ in Taiwan where he attempted to overclock it as much as possible on the Asus Rampage VI motherboard. You can see in the above screenshot that an overclock of 6106MHz was achieved. For further world records broken yesterday, thanks to the new Intel Core i9 7980XE, head over to the HWBot records page and search for '7980XE'. You will note that overclocker Splave also did well to claim three CPU benchmarking world records using the processor together with an ASRock X299 OC Formula motherboard. Elsewhere you can find listed the new achievements by KingPin, Der8auer, Elmor and others. You forgot to mention that the CPU alone was pulling nearly 1000w at 6.1ghz, still mighty impressive considering it is all the cores at 6.1ghz. 1000W?! I was wondering why they needed two PSUs…. I'm excited for the day that such compute performance is readily available, much cheaper, and doesn't require two 1600w PSUs. Can finally play Crysis on full settings?